The current wage story as I see it. There was a fair bit of excitement and commentary about nine cents last week. I’m talking about the increase in the average hourly wage from November’s strong jobs report, an increase in 0.4%, which is, in fact, a sizable bump for these monthly data. But the monthly data are noisy, and the prior few months this hourly wage measure had been pretty stagnant, so some of what we saw in November was just catch up to the not-so-impressive wage growth trend that has persisted for years now (I thought some of the reporting got too close to pronouncing our wage problems–which have persisted for decades–behind us based on one month of noisy data). The much better way to get at that underlying wage growth trend is to look at the year-over-year percent changes. Since 2010, average wage growth has averaged 2% with a standard deviation of 0.2%, meaning that trend has been pretty steady. In fact, when you measure the November wage gain compared to November 2013, the increase is…wait for it…2.1%, right on trend. That’s just a bit better than the rate of inflation, meaning worker buying power has been pretty stagnant in real terms. To the extent folks are getting ahead, it’s been coming from more work at flat real hourly wages. Given the obvious and even accelerating improvement in the US economy, why is it taking so long for overall growth to reach paychecks and what does this imply for policy makers? The three most important (and closely related) factors are likely historically weak bargaining power of most workers, the long-term absence of full employment, and the earnings inequality firmly embedded in our economy. –Given the fact of the Fed’s 2% inflation target and productivity growth of something like 1.5%, nominal wage growth of 3.5% is not inflationary, so there’s at least that much room to grow. –One outcome of higher inequality has been more of the nation’s income going into business profits and less into workers’ paychecks. So compensation as a share of national income, a variable that was pretty stable for decades, is down five percentage points since 2000. That’s the equivalent of $740 billion today, or about $5,000 per worker, shifted from the compensation slice of the national income pie to the profit share. My point here is that this creates more room for non-inflationary wage growth, through a shift back in at least some of this income from profits to paychecks. –Much like the mechanisms that translate diminished labor market slack into faster wage growth, the ones that channel wage growth into price growth are also operating below their usual levels (technically, both Phillips wage and price curves are pretty flat right now). Finally, here’s something new. Using a comprehensive measure of labor market slack (created by economist Andy Levin), and making the assumption that it continues to close at about the rate it’s been falling over the past year, I constructed a simple model of compensation growth that regressed an index of yearly wage growth (a combination of five different series on wages, weekly earnings, and total comp) on labor market slack and lagged values of the wage growth series. The assumptions about the path of slack may be optimistic, but they follow the recent trend: involuntary part-time work and labor force participation fully normalize, and we hit full employment as measured by CBO—i.e., we close both under- and unemployment gaps—by late 2017 and stay there after that. Of course, this embeds the assumption that the recovery proceeds apace. At any rate, you see the results below. The predictions from the simple model at least loosely track the actual year-over-year wage growth series, particularly most recently, which matters most for the forecast. And the punchline is: the forecast has wage growth hitting 3.5% by the end of 2018. Source: my analysis; see text. One key implication of this finding is that the Federal Reserve must proceed with care and heavily weight the asymmetric risk profile they face: from the perspective of millions of working households, the downsides of acting too soon are worse than those of holding off. 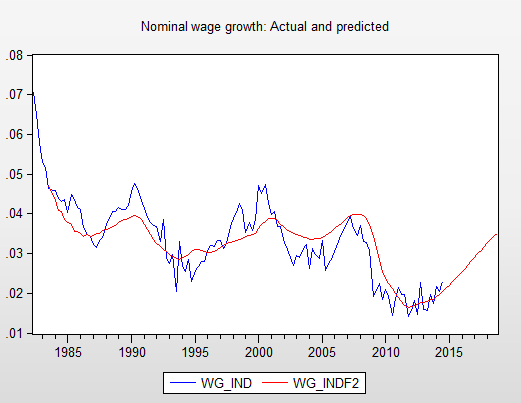 Second, while the model is simple and could easily be improved upon, I suspect its central message will hold: if we want to see wage growth get back to the point where the benefits of grow begin to be more broadly shared, it will take not just getting to full employment, but staying there. Finally, remember, this simulation is largely driven by average wage and compensation measures. For the expansion to reach middle and low-wage workers it will take even more persistent banishment of slack. So sure, I’m as happy to see nine more cents as the next guy. But I assure you, one month doesn’t change much. It may well still be years before we see the recovery show up the way it should in worker pay. Share the post "The current wage story as I see it." 7 comments in reply to "The current wage story as I see it." and a half for overtime! Comes to exactly.. $852.74! You are looking at the wage rate for all employes. But if you look at average hourly earnings for non-supervisory employes the gain was only 0.2% and both the three month moving average rate of gain and the year-over-year increase of this measure shows that wage gains are still slowing. Sandwichman deserves an Emmy or a Fiscy or at least a doughnut. Five years from today, without a job or a raise or 200 channels of prime TV, I should be receiving enough SS retirement to afford an internet connection and have available to me…well, maybe internet TV. 9 cents and the Higgs Boson particle might get you into heaven…but not an assisted living community. Say no to immigration without full labor rights. Better yet, watch the median wage, not the average. In a time of record inequality, how could one not? The middle class is collapsing. You know, I could really use a $5000 raise. So could most of us, I bet. Earlier this month, I saw a bunch of news releases regarding those FLSA overtime rule exemption changes (and an increase from that $455 a week figure) that say that DOL is targeting February as a deadline for a new set of rules to come out. That would mean that employers would have to toe the line within months of any new rule soon afterwards, right? Is this timeline right, based on what you’ve been hearing? What is your guess as to the new guideline figure for weekly pay threshold figure? $800 or $900? ?